It's really really uncommon that I feel connections with things, but while my girlfriend was out shopping making up her mind between two business suits that looked exactly the same, I stopped by a watch store. 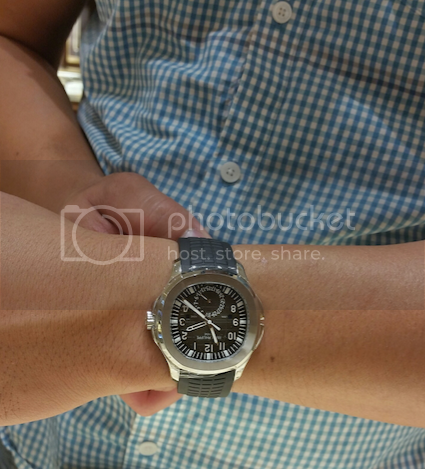 Not really being into Patek Philippe I had heard of the Aquanaut but it never looked great in pictures to me, and if I'm honest it didn't look like much in the display case, but on my wrist I was really blown away at how awesome it looked on my wrist. I rarely ever feel like a watch suits me and feel that watch and human just could click so well. I didn't even feel it so strongly with my only other watch, a Rolex GMTIIc, but I felt it with this. My girlfriend also loved it. Next Topic: Jack Swigert. University of Colorado. Omega Speedmaster. 14 seconds.